For full review, go to Kirkus Reviews for Selling to Heroes, Villains and Geeks. 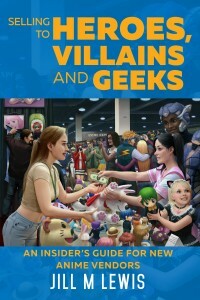 For full review go to Midwest Book Review of Selling to Heroes, Villains and Geeks, and look in “The Business Shelf” section. An information-rich book that steers you through every critical step from sourcing your merchandise to ultimately meeting your goal of being swamped by customers at your very first convention. Bursting with unfiltered advice, insider tips, pertinent website resources and vendor disaster stories, you’ll hurdle mistakes that caused other new vendors to crash and burn. Growing up, Jill always thought having mutant powers would be the best gift ever. Never mind the distrust from the non-mutants, the hours of training to master my powers, or the fear of going over to the dark side – mutant powers would be a cinch to handle. Heck, X-Men’s Storm manages it just fine. Alas, no mutant powers ever materialized. But she did discover her power to earn an MBA from Columbia University and turn into a high-performance marketer. Mere mortals, like Jill, could change the future with smart, creative, customer-focused marketing plans. For twenty-five years, she launched products that rocketed to success, developed memorable advertising campaigns, and guided businesses that generated hundreds of millions of dollars in annual sales. And she went on to fly all over the world without the assistance of any mutant powers. She conducted business in London, Paris, Frankfurt, Geneva, Milan, Tokyo, São Paulo, Beijing, Hamburg, Barcelona, Johannesburg, Toronto, Mexico City, Prague and every state in the US. For the past several years, Jill used her marketing powers to vend at anime, comic and sci-fi conventions. Her customers are heroes, villains and geeks who use their creative powers to bring their favorite characters to life with a little help from her merchandise. She knows what piques their interest and opens their wallets or purses. Jill can even get Moms and Dads to pitch in several bucks – it’s not easy being the parent of heroes and villains. And this all of this has helped Jill become a strikingly-successful vendorpreneur. Follow Jill on Twitter @animevendor, facebook.com/animevendor or pinterest.com/animevendor. Subscribe to our newsletter and receive a bonus video in your inbox the same day the book officially ships. A veteran vendor spills her secrets about her merchandise, display setup and pricing to help new vendors rocket to a fast start. This is one bonus video you’ll be glad you watched.